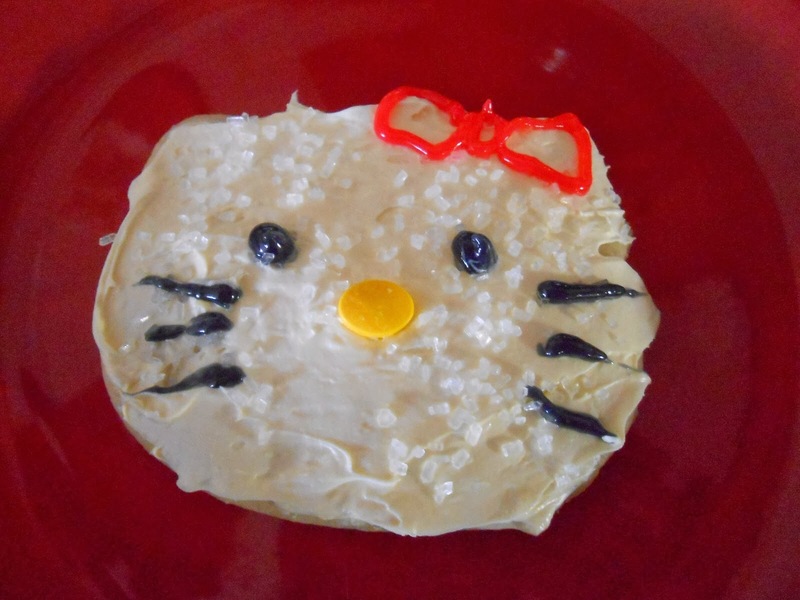 For my birthday tea today I made Hello Kitty cookies to celebrate being on Medicare!! Oh my word, can I really be this old?? Yes I can, but I certainly don't feel it. I might as well keep having fun and enjoying Hello Kitty things. I thought I'd share the cookies with my family as party favors, and enjoy some with a cup of my favorite eggnogg'n tea. Isn't this cookie adorable? I used my favorite sugar cookie recipe, found here. You can use your favorite buttercream frosting or royal icing. Royal icing would be prettier and smoother, but I prefer the flavor of buttercream. Icing gels were used for the eyes, whiskers and bow. I had special yellow candies for the nose, but a yellow M&M would work, too. My plateful of cookies ready to share with my family! Happy Birthday, Kitty! I know your family will adore those darling cookies. I Hope you have a wonderful day!!! 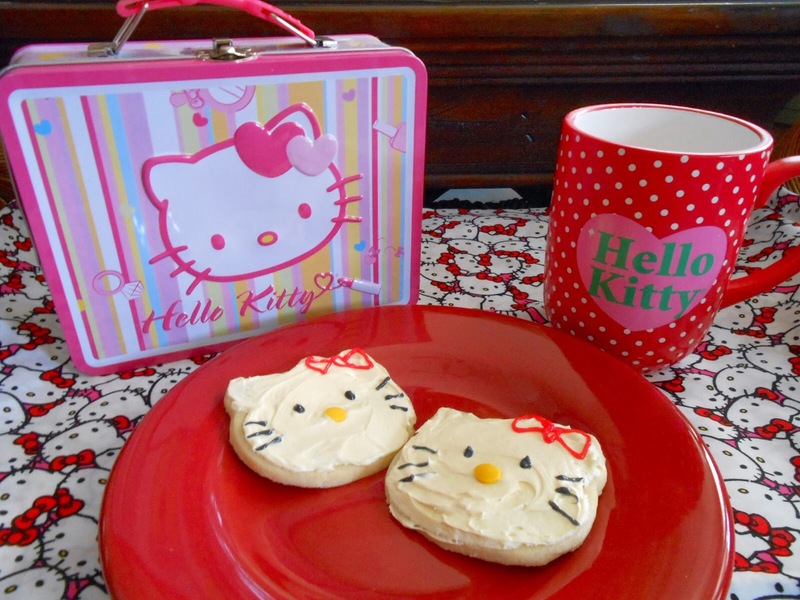 The Hello Kitty cookies are adorable and I wish I could have one over tea with you to celebrate today. Every time I see Hello Kitty things in Micheals I think of you, I'm sure you have quite the collection of memorabilia. Happy Birthday, Kitty! Those cookies are adorable! Happy birthday and welcome to the club! Lol! The cookies are darling! Hello Kitty, and welcome to the next chapter of life! And many more to come! Your cookies are adorable, Kitty! Happy birthday! Happy Birthday, my sweet friend! Your Hello Kitty cookies are so cute and would I ever love to sit and help you celebrate your birthday with a cookie and a cup of tea. Whenever I see Hello Kitty anywhere, I automatically think of you. Hope you have a delightful day to celebrate the delightful lady you are! Happy Birthday, Kitty! I'm having my medicare birthday this year and am making out the forms ... now waiting for the response by mail! Great way to celebrate your birthday with "Hello Kitty" -- perfect. The cookies are too cute to eat! Happy Tea Day Birthday Girl! Happy birthday! How cute are those cookies! Happy Birthday Kitty. Those cookies are adorable. That's right Kitty - I already forgot (shorter memory) today is the big HAPPY BIRTHDAY DAY! And isn't it wonderful paying like $300.00 a month nstead of the $797.00 I was paying for castrophic insurance. That was terrible and I just want back what they withheld from me for years - hardly my idea of an "entitlement". So before I ramble even further "Happy Birthday to you"!!!!! Happy birthday, Kitty! The cookies are so cute for your party, and NO you can't possibly be old enough for medicare! Adorable Hello Kitty cookies for Kitty, the Birthday Girl! Happy Birthday! I hope you had a perfect day! How cute! You are very patient to make and decorate these. I hope your family enjoys them ~ I love sugar cookies. Wishing you a very Happy Birthday and a wonderful year to follow! How FUN to get to celebrate your birthday with such "appropriately" cute treats!! Wishing you many more healthy years ahead. I heard on the radio today that "60" is the new "40"!!! The cookies look great! Leave it to you to bake your OWN birthday cookies!!! Happy happy Birthday to you. Its never too late to be a child. We can enjoy the fun as long as we live, right! What does the amount of year means? Nothing, because one is as old as one feels. And our generation stays much younger, even when we count a lot of years. We live really in a blessed time. I love your funny Hello Kitty cookies. They are purrfect for your birthday. I wish you a very happy birthday celebration with your kids and a wonderful new year of life with health, prosperity and luck. And all the wonders, which will come! How precious these are! My nieces love Hello Kitty (sister in law is from Japan) and so she really turned them on to her when very little. Congratulations on celebrating you and the next chapter, I love the idea! A belated Happy Birthday! Hope you had a wonderful day, and keep on celebrating! My Mary Engelbreit calendar page for today said "There is no key to happiness, the door is always open". I like that! Those cookies are very cute! Happy Birthday Kitty! Your cookies are a perfect way to celebrate, I prefer the taste of buttercream to royal icing too :) Love the quote from Donna G's calendar. Hope your celebration was delightful! I hope you had a lovely birthday! Nice that Hello Kitty could be there! lol! Those cookies look a treat! Buttercream is the best icing! I still use and old recipe from a Hershey's cookbook for kids I had as a child. Congratulations on turning 65! Although, you do look 20 years younger than that! : ) I am turning 55 in a couple weeks and I can hardly believe it. Time just goes by so fast! I am wishing for you a year of lovely surprises and many opportunities to experience joy. Hope your birthday was extra special. How can it not be with Hello Kitty cookies and Medicare. These are darling Kitty. The French are most polite about aging. They refer to us as "a woman of a certain age". Happy Birthday. Happy Birthday Kitty!! Welcome to the club, we are happy to have you, it is the best part of your life! I love what Madonna said about the French calling us "a woman of a certain age". Your cookies are just adorable and we would love them,(more than one). Thank you so much for sharing this awesome post with Full Plate Thursday and have a great weekend! Happy birthday Kitty! Your cookies are so cute and look so yummy, and you look great reaching that Medicare age.....yay for us boomers! Have a terrific year. 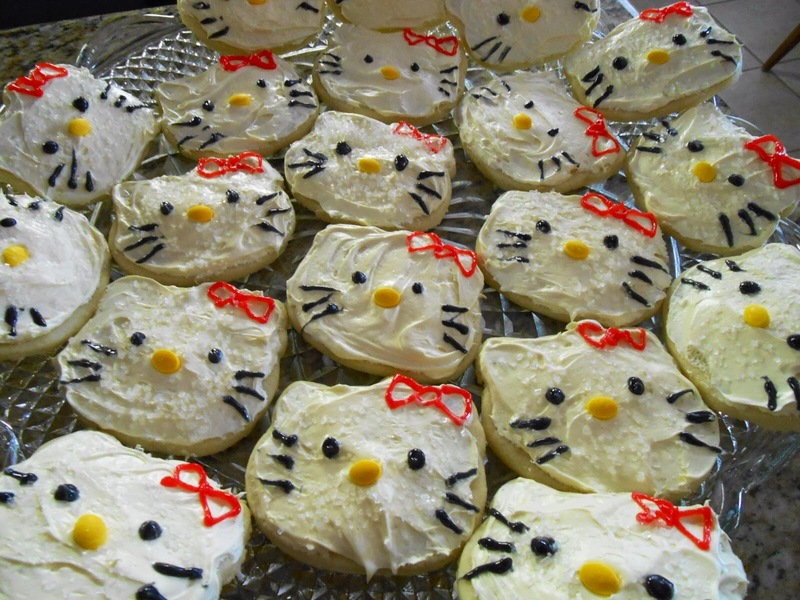 Of course you must have Hello Kitty cookies Kitty! How adorable, and great way to celebrate a birthday! Forget the medicare stuff, you are obviously young at heart! Oh my I so so love Hello Kitty because she's a cat and she's a theme of PINK! <3 I am so fond of this character that makes me compile stuffs of her like wallpapers and just lately I started a collection of Hello Kitty Birthday Party Theme . I am just so happy I could pick some from your site. Credits will be added dear!